A city full of Churches. During our most recent visit to Spain, we went on a coach tour to Granada for three days and two nights. The thunder and lightning had thrashed our plan for an early night and a decent rest, before we left. The rain had ceased, literally minutes before we departed, but we still had to walk on our heels through deep puddles. We lifted rather than wheeled the large travel bag, in an effort not to wake the villagers with our own thundering trolley. The bus arrived and left on time, and after several pick-ups, the day was dawning and the sun shining as we commenced the five-hour journey for real through the Murcia and Granada countrysides. The driver's name was Ishmael, although he didn't invite us to call him that. We were introduced to him, not by Captain Ahab, but by our friendly guide, Maggie. As we sped through the acres of fertile plains, she kept us informed about the legends, the fame and infamy of the various places on our route. What we thought were peat-lands, turned out to be vast drills of lollo rosso lettuce at one stage of the journey. The twenty-two bells of Murcia Cathedral might have been calling out to us, as we detoured around the city, but we didn't hear what they were playing. Having stopped for a deserved break at the Legoland hotel, we sat back refreshed as Ishmael surged ahead, at times with one hand gripping the wheel, and the other his gear-stick like a trusty harpoon. This is big country, and you'd expect to see Gregory Peck on the horizon, consulting his compass. Clearly the road network has been laid, gouged out and smashed through some of nature's most formidable barriers. But what man has achieved, pales against that of God and the elements' ability to expose, ridge, carve and level the most awe-inspiring designs upon the landscape. But the Hombres and the Senoras have survived the terrain and the climate, through their own feats of ingenuity, skill and obvious necessity. Trees of almond and olive proliferate along a piece of land, the length and breath of Leinster. Have tractor, will travel, across plain and up mountain slopes. Baza was here, too and had a town and a mountain range named after him. A large percentage of the population in a place called Gaudix, had hewd, picked and dug cave-houses for themselves and their families, out of the surrounding hills and mountains. This particular part of the countryside could have been Lord of the Rings territory, remarked my travelling companion. And all the time, as we crossed yet another deep ravine, over a stomach-churning high bridge, we were aware that we were nearing our goal. And then, there it was, the sign for Granada Oeste, which Ishmael targeted, swinging the bus around on the final part of the journey. We descended perilously through the Albaicin area and caught our first glimpse of the famous Alhambra palaces, and indeed the entire city plain. When we reached our hotel on the Grand Via, we were glad to be on firm ground once more. Although we were tired, we 'freshened up' very quickly in our hotel room and departed for the Cathedral. The Cathedral of the Incarnation is vast, magnificent, awe-inspiring on the outside and equally as breathtaking on the inside. Giants designed and built this imposing structure in honour of beliefs which they could obviously barely contain. At least that is what a normal human being might assume when contemplating the imposing ediface. Measuring 115 m by 65m, it was begun in 1518, on the site of the city's main mosque, and worked on for the next 181 years, but officially remains unfinished! 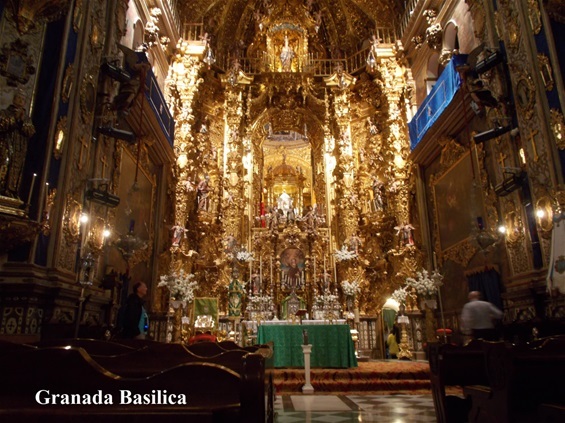 You get some idea of the initial grand conception from the thickness of the walls and Corinthian columns, the chasmic entrances and inner cavernous space, where you lose your outer self in the Spanish Renaissance and Baroque style of the overall design. There are effigies of Queen Isabella and King Ferdinand, busts of Adam & Eve and works of art by El Greco, deRibera and Cano. The afficionados of such creations must surely sense every nuance of genius present. For the rest of us, once we have circled the main altar, and come and rest and kneel before the Eucharist, it becomes a very simple act of adoration to God, a thanksgiving for our lives and a request to help and to heal where we feel it is most required. It was raining by the time we emerged into daylight. As we sheltered in a quiet cafe on the Grand Via, we became immersed in old black and white pictures of the Cathedral, taken centuries before, and which hung on the walls of the restaurant. In one, the blessed structure dwarfed several subservient donkeys, tethered along one side of the giant building. These humble beasts of burden served to remind modern man with all of his computer aided design tools, theodolytes, space rockets and Lear jets, that his ancestors created wonders of the world with simple tools, buckets of sweat, manual labour and at enormous risks to their health and safety. And yet, and yet here stood their creations, having survived, perhaps appropriately enough, 'acts of God', and the grossest acts of man, to rightly take their place in the 21st century and beyond, as timeless as the deity in whose honour they were initially conceived. Over the next two days, we visited several Capillas, all dark and dreary with the dust of ages, until they were lit up for the commencement of mass, when some of their former glory shone through. But it was the Basilica of St John of God which proved to be, in our eyes and minds, the hidden gem of the city. Entrance to the main body of the building is 'free' to those attending morning and evening mass. At other times, you give a donation to help the sick and indigent. On our first evening in Granada, we chanced by the building, just as mass was about to commence. While small in comparison to the Cathedral, it was the light emanating from the 'elaborate', gilded ornation of the central altar which filled our senses and left us in awe. The next day, we immersed ourselves in the full meaning of this beautiful structure. The 'audio information device' - essentially a phone with pre-recorded messages, delivered detailed descriptions of the basilica and its contents, in a beautifully modulated English accent. And we lingered for too long in the sacristy, listening to exacting detail on conception, design and decor before tuning out and 'doing our own thing'. As you follow in the footsteps of priests and hierarchy, and emerge into the main body of the building, you are struck by the glittering beauty of it all. Perhaps critics might blanch at what they perceive as the 'over-the-top' gilded finish of the complex, wooden carvings, especially on the main altar, but to discount the reason for this, is to ignore the significance of the work. The audio device was useful when you wanted clarification at certain points, but it was Senora O'Leary who threw the greatest light onto the subject when she popped a coin into the meter and flooded the central area with magnificent luminescence. Spirits were raised enormously, in everyone present, as the altar was clearly perceived, in the light in which it was meant to be. 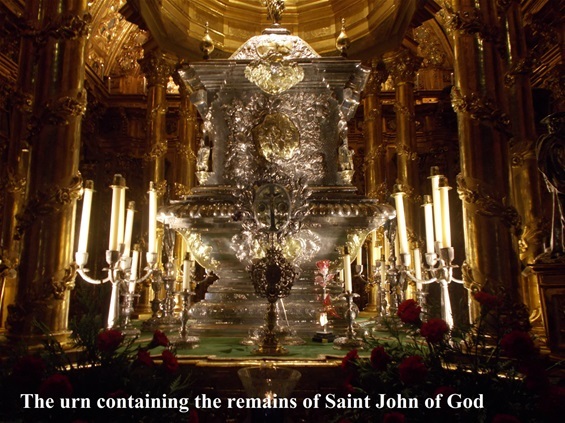 A guide was then prevailed upon by a determined tourist, and we were admitted upstairs, to view the magnificent silver urn in which had been placed the remains of St John of God. We felt, not honour, but gratitude to be within touching distance of the saint's final vestiges of his humanity, visible during mass, but at a distance, behind a large gilded retable, which concealed the camarín or shrine dedicated to the saint, and in which we now stood. In this inner sanctum, made up of three rooms, we were surrounded by various relics and paintings; and could view a barely constituted alms basket, original mass books and vestments. We attempted to grasp, for the sake of the people that the saint served, the significance of our own presence and place in life. Who are we? What have we done? What will we be remembered for? 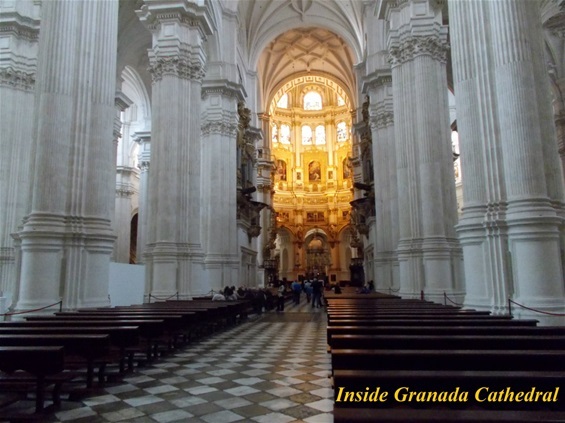 From the basilica, we walked to The Capilla Real or The Royal Chapel of Granada, situated next to the Cathedral. 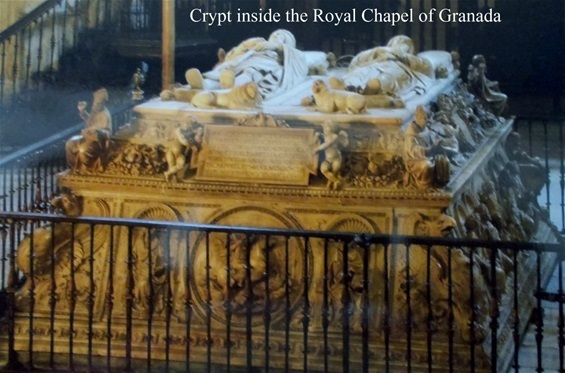 This building is most notable for also being a mausoleum - the final resting place of the Catholic monarchs, Queen Isabella and King Ferdinand, their daughter Joanna and her husband, Philip; and the Queen's two-year old grandson, Miguel. There was an anxious air about the place from the moment we stepped across the threshold - the receptionist told us we had fifteen minutes to look around before they closed for siesta. The strict no pictures, no videos rule was imposed upon one unfortunate woman, by a barrel-chested security man, a case of no-way José-phine. The place of the Queen and King in Spanish history is of enormous significance, marking the end of the Moorish dynasties, a return to Catholic rule and the establishment of the country as a significant world power. 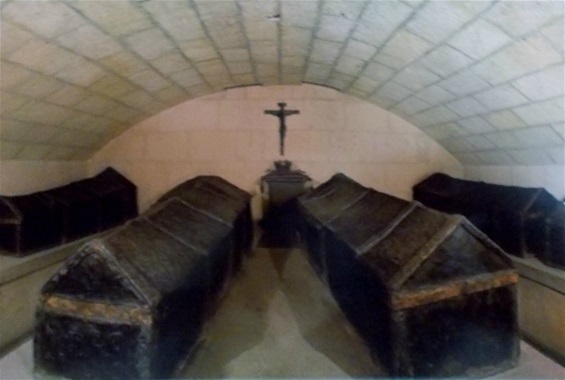 Viewing their coffined remains in the crypt at the centre of the mausoleum, brought on emotions of sadness, reverence and respect, but also a reminder that even the great and the good are mere mortals. It is not possible to do these christian constructions and works of art justice with paltry words. While you can read copious amounts on them, it is true that you must be there, in the moment, for that personal experience, which nothing else can prepare you for. What of The Alhambra, you ask? Isn't that what Granada is most famous for? Apparently, yes. This former Moorish palace sits atop a plateau, with commanding views of the city, surrounding mountains and the plain beyond. While over two million tourists a year gain access to it, we would estimate that at least the same number of people are refused admittance, basically because of the necessity to prevent damage to the decor. Accordingly, it was a sold-out performance by the time we dragged our weary legs to the summit. But along the way we had enjoyed panoramic views, and we did get some idea of its achievement, through our views of the painstakingly constructed outer walls and approaches. Threading all of those cobbled paths, however, did leave us simple soles feeling tender. To sum up, a walking tour of Granada's Christian works is thoroughly recommended. They are all readily accessible. However, should you choose to visit the Alhambra, the Albaicin district or anywhere else up a mountain, take a guided tour, train or bus and plan ahead. Otherwise you'll end up crippled and perhaps slightly annoyed with each other.